A Relay for Life volunteer, CARES Community Service Coordinator, and Peer Mediator, Shannon Zangas is a new Freedom Alliance Scholarship recipient from Butler, PA, who aside from her impressive extracurricular activities is pursuing a degree in International Studies at Dickinson College. Lieutenant Colonel Robert J. Zangas, Shannon’s father, was killed on March 9, 2004, in Iraq by men posing as Iraqi police who ambushed his vehicle killing him, his translator and partner during Operation Iraqi Freedom. Prior to his civilian position in Iraq, LtCol Zangas was an active-duty Marine from February 27, 2003, until his honorable (not final) discharge on December 29, 2003. In a letter to Freedom Alliance, Shannon expresses that not only will the Freedom Alliance Scholarship enable her to attend a terrific college, but as a student can furthermore explore other opportunities at Dickinson such as studying abroad and providing service to the off-campus community. 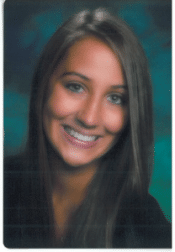 Freedom Alliance supports hundreds of students like Shannon. We are now accepting applications for the 2013-2014 academic year. To learn more or to apply for a scholarship, visit www.fascholarship.com.